Tonight begins the free Friday movies at the Hatch Shell and the Boston Harbor Hotel. I couldn't get excited about "Happy Feet 2" or "The Way We Were" (respectively). On the other hand, the Hatch Shell has a nice big lawn for sitting/picnicking and BHH has various steps to sit if you don't like grass. CTB is sounding a 'Greek Festival Alert': FRI 6/15 to SUN 6/17 at Saints Constantine & Helen Church (Cambridge). The same body of water that runs past the Cambridge River Fest also passes through Waltham. Over 3 days, the Waltham Common/Moody Street area will be teeming with music, dance, arts, culture, vendors, etc. Keep an eye out for people selling wristbands ($5). They grant you discounts to a bunch of restaurants/stores (such as Margaritas, Tempo, Watch City Brewery, Tom Can Cook, Gourmet Pottery, Stadium Bar) where you can save more than $5. Kicking off a couple weekends of free architecture/design walking tours, this party seems like a chance to hang with creative people, try a honey-infused beverage (probably not an open bar at $10), and check out some sustainability art and information. Proceeds benefit the Boston Cyclists Union. Nearly every performance of the Michael J. Epstein Memorial Library is an event in some way or another -- even just to coordinate gigs for a folky/poppy mini-orchestra. Beyond the twee-magical tunes, the extra-special aspect is that the MJE Memorial Library will provide live accompaniment to "A Brief History of Flight", the silent film that they created! For those interested, there is a deal to get into this show, their July gig at Church, a limited-edition DVD, and a CD/download for $20 -- pretty sweet and you've got something to do on Friday 7/13. It's a good variety with Velah that rocks like a new version of Static of the Gods (because it is) and the rootsy Rumble semi-finalists Cask Mouse. Tallahassee finishes up the night with solid indie-folk not expected from a guy who briefly played for the Pats. I wonder if guys in Beware The Dangers of a Ghost Scorpion still wear masks? There is little doubt they will assault the crowd with a set of horror-influenced surf rock. They're joined by a cadre of arty, punchy, noisy indie-rockers. 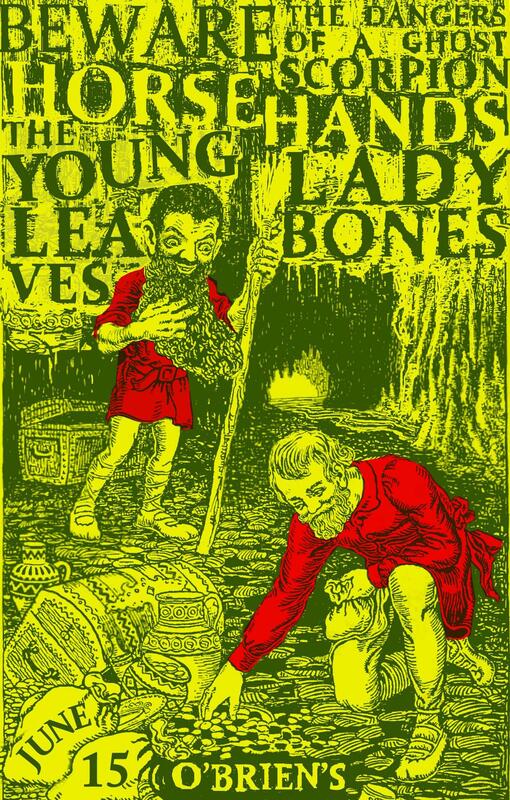 There's nothing wrong with Lady Bones, but they were a bit of a let down after watching a cool video of another band that has a song called "Lady Bones". Another Rumble semi-finalist Thick Shakes are anchoring a fun night of garage-rock and freaky/funky Jamaica Plain bands. Yes, there will be poetry between bands. It should a crowded, semi-sweaty good time! The previously scheduled midnight movie didn't arrive, so the Coolidge looked around their basement and found a 35mm print of a cheesy mid-'80s sexploitation movie with bad acting. Sounds like fun!